A set of 2 stamps and a mini-sheet were issued on November 13th 2000 to celebrate the 150th anniversary of the birth of RLS. The $5 stamp (above left) prepays the overnight rate. 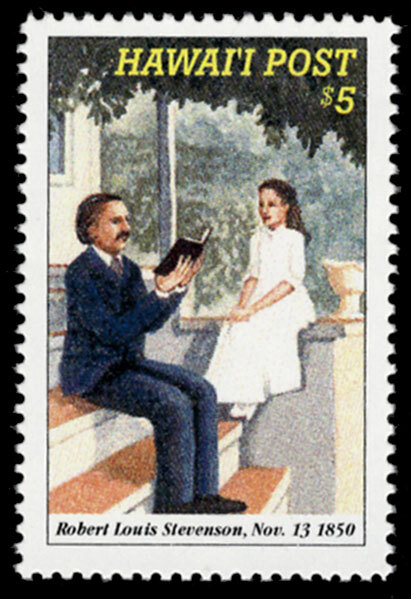 It shows RLS reading a book to the young Princess Ka'iulani on the steps of "Ainahau" in Waikiki. The $8 stamp (above right) prepays the Same Day rate. 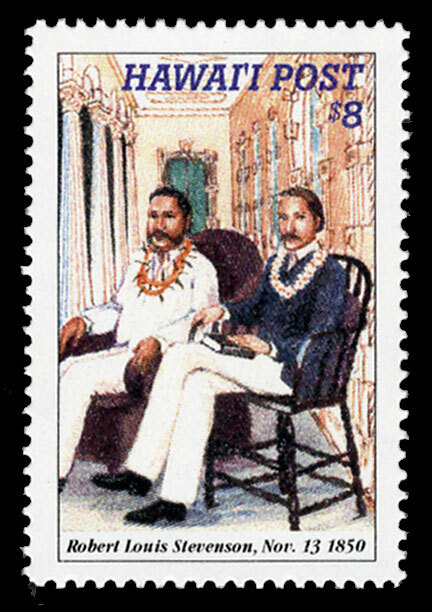 It shows RLS sitting with King Kalakaua on the verandah of I'olani Palace in Honolulu. The $5 and $8 stamps are from original miniature watercolors painted by local artist Wayne Takazono. Both stamp drawings are © Hawai'i Post. The $3 Mini-sheet (below) plus the $5 stamp prepay the Same Day rate. written by him for Princess Ka'iulani before she left for Europe in 1889 to finish her education. To smile in Ka'iulani's eye." Born in Edinburgh Scotland on November 13th 1850, Robert Louis Stevenson grew up to become a successful writer. His books include "Treasure Island", "Kidnapped", "The Strange Case of Dr. Jekyll & Mr. Hyde" etc. In France, he met his wife Fanny, an American. With her, he travelled widely including a trip to Hawai'i where he visited King Kalakaua and Princess Ka'iulani. Before the Princess left for Europe in 1889 to finish her education, he wrote a special poem for her (shown on the $3 mini-sheet). He finally settled in Samoa and died there in 1894. A First Day Cover was issued on November 13th 2000 with a special cachet and postmark (above). Covers were made on high-quality paper envelopes in white and gray. 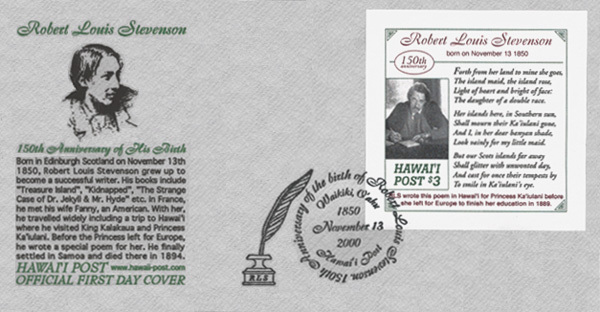 The special cachet above depicts a drawing of a young Robert Louis Stevenson and a short biography. The special First Day postmark for the above covers was issued for November 13th 2000 only. The postmark has a quill pen in an inkwell with the initials "RLS" on it. 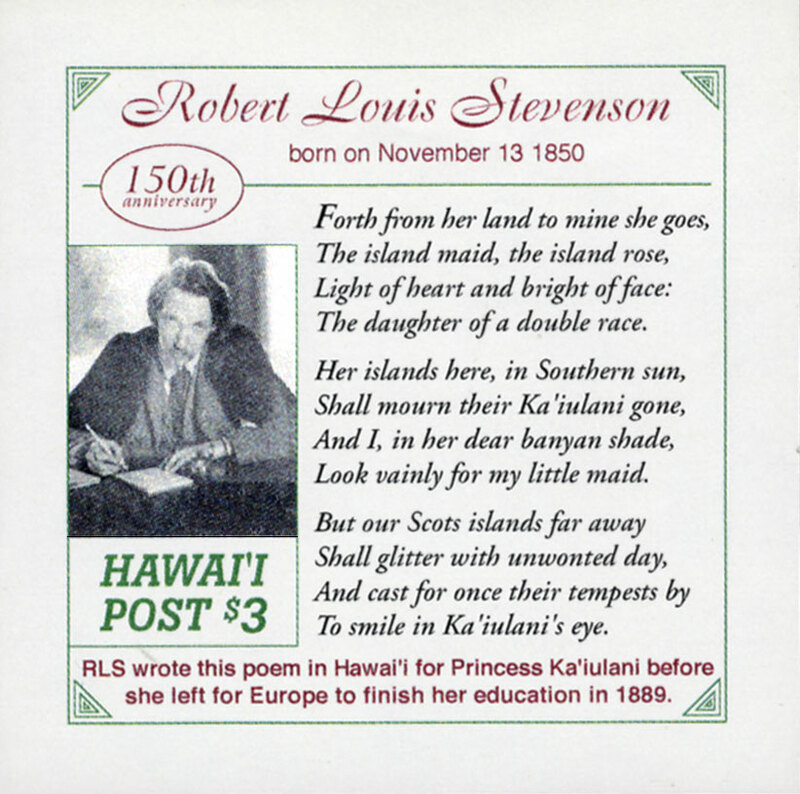 The circle cancel is in script and reads "150th Anniversary of the Birth of Robert Louis Stevenson" and also "Waikiki, O'ahu. Hawai'i Post" The center lines across read "1850/November 13/2000." Hawai'i Post operates under the exemption to the U.S. Private Express Statutes that allows urgent mail. The relevant statute is Section 39 CFR320-6. May 1997, "Hawai'i Post" is established as a messenger and delivery service in Waikiki to pick up and deliver urgent mail. May 15 1997, "Hawaii Post"is registered as a Tradename in the State of Hawai'i. February 10 2000, the domain name www.hawaii-post.com is created. 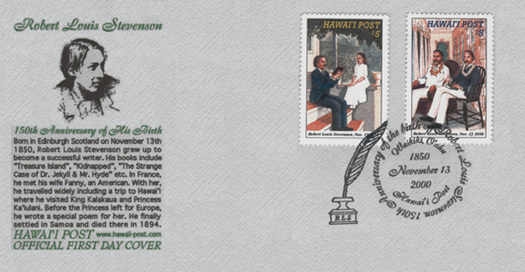 June 13 2000, "Hawai'i Post" starts issuing postage stamps for prepayment of services. September 19 2000. "Hawaii Post"is re-registered as a Tradename in the State of Hawai'i until February 10 2011. The name "Hawaii Post" is a pending Service Mark before the U.S. Patent & Trademark Office.